Posted on Wed, Jan 18, 2012 : 2:39 p.m. Break out the down coats, boots and furry hats. A one-two punch of cold and snow is headed our way. 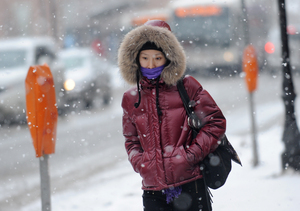 Cold and snow is in store for the Ann Arbor area over the next few days. A cold front headed for the Ann Arbor area will send temperatures plummeting into the single digits Thursday night. Snow is expected to move in as well with about 4 inches expected Friday night, said Amos Dodson, National Weather Service meteorologist in White Lake Township. After a high of about 27 today, temperatures will remain mostly steady overnight and then begin falling during the day Thursday. They’ll drop a low of around 6 degrees. Wind chill values could drop to 1 below zero. About an inch of snow is likely Thursday but most of the snow will come Friday. About an inch is expected during the day with 2 to 4 more inches likely Friday night. But take heart. Our little dip into the deep freeze won’t last long. “Friday and Saturday will still be cold, but only a few degrees colder than normal,” Dodson said. By Sunday, temperatures will be back in the mid-30s. Come on, Ann Arbor! Woman up! Thu, Jan 19, 2012 : 4:10 p.m. Daughter's birthday is the 21st. Since she was a little girl, we've joked that she was born on the day of the worst winter weather. Seemed every year birthday plans were threatened by winter road conditions, etc. Now days, the Washtenaw Biking and Walking Coalition holds their Worst Winter Weather Ride -- on Jan. 21st. Until the 1980s, had to commute 78 mi. per day. After that: I've succeeded in finding work IN Ann Arbor. So from that standpoint, I've saved myself untold hours of tension, drastically reduced my chances of being injured or killed on the highway and saved over $100,000 in transportation costs in the bargain. Thu, Jan 19, 2012 : 10:31 a.m.
Thu, Jan 19, 2012 : 1:12 a.m. This impending cold front will cause dangerously low temperatures and result in slippery sidewalks that will be hazardous to our city's pedestrians. City council must, must pass an ordinance prohibiting low temperatures immediately. Won't someone please think of the children!?!!? Thu, Jan 19, 2012 : 1:10 a.m. I just figured out why those bags of ice were stolen. To do a snow and ice dance. Wow. We don't need rain, have enough of that so we might as well make it snow and sleet. Wed, Jan 18, 2012 : 11:30 p.m.
Got to laugh at those of you who joke and complain that the forecasters are just doomsayers and often not correct, but then moan and groan when we get a storm and the roads are icy and the snow plows and trucks don't get the roads cleared quickly enough. Which is it? Listen to the weathermen or not? I think there were 100 reported accidents, including ambulances, firetrucks, and school busses due to ice and snow on area roads as the trucks struggled to keep up with the snow plowing, salting, sanding, etc. while people refused to drive safely given the conditions -- as in slowing down, leaving a bit earlier than normal, etc. LoL, darned if they forecast it and darned if they don't ..... or maybe just lots of complainers around ? Wed, Jan 18, 2012 : 10:23 p.m. Remember! Every time it gets cold, you have to say, &quot;Oh yeah? Where's your Global Warming now?&quot; (You *have* to say it. I think it's an unfunded mandate or something.) And every time (every time!) it's unseasonably warm, you have to say, &quot;Oh, yeah! I got your Global Warming right here, Baby!&quot; Repeat ad nauseam. At the end of the season, you count up the numbers of question marks and exclamation points to see whether Global Warming is real or not. Dear Mom, Goodbye, Mom. It's official. We in Ann Arbor are doomed. We got the news on the incoming weather this afternoon from annarbor.com and, boy, is it grim. Tell Fluffy and Dad I love them both and don't let Junior put his tongue on the plow again. On the other hand, Mom, just a few days ago annarbor.com warned me it was gonna snow like heck and guess what? I wound up trimming orange trees in the backyard. Well, sooner or later they will be right. Thu, Jan 19, 2012 : 1:08 a.m.
PS Just remember the Ides of March are upon us when the lion goes in and out comes a lamb. Go figure. Wed, Jan 18, 2012 : 9:23 p.m. Wed, Jan 18, 2012 : 10:10 p.m. Wed, Jan 18, 2012 : 9:45 p.m. Wed, Jan 18, 2012 : 8:57 p.m.
Back on the horse on Friday! Woot! Wed, Jan 18, 2012 : 8:44 p.m.
Not that I like cold, but I feel like I've been living in the Twilight Zone. Wed, Jan 18, 2012 : 9:39 p.m. Wed, Jan 18, 2012 : 8:24 p.m. Wait &amp; see. The weather news has not been too accurate lately. Wed, Jan 18, 2012 : 10:36 p.m. Unless you count all the recent accidents recently due to the recent predicted storm ? Wed, Jan 18, 2012 : 8:09 p.m.
Thu, Jan 19, 2012 : 1:06 a.m.
Actually this weather is Montana in June. When we were there for the week we had temps in the 30's and 40's. Really not fun coming home to 90 for a month. If this summer is like the last? I am heading north for a month. Wed, Jan 18, 2012 : 8:03 p.m.
Yay! Winter should be cold. A return to normalcy.